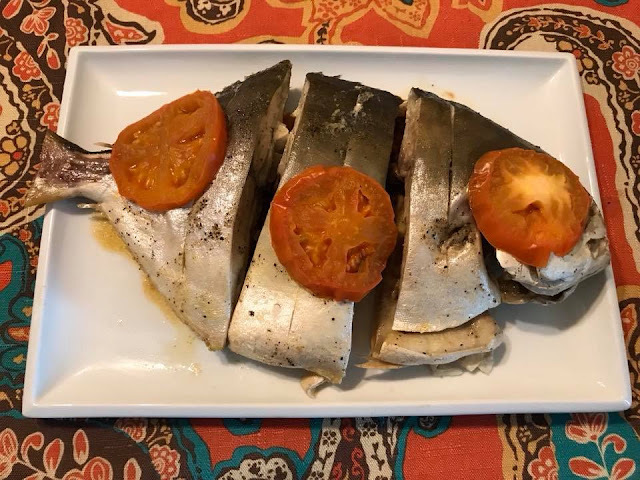 Easy Grilled Pompano Fish in foil packet is one of my favorite fish dish. Instead of steaming or baking I decided to just wrap it in aluminum foil and grill while I am barbequing some Pork Ribs. You can use any fresh fish that is available to you like Tilapia or Salmon. Tear off a sheet of heavy duty aluminum foil about 10 inches long. Double the foil if needed. Place fish in the center of the foil. Season both side of the fish with salt, ground pepper and minced garlic. Drizzle with olive oil and top with slices of tomato. Fold up the edges so it's completely sealed and no steam will escape. Heat grill on high heat. When the grill is hot, place foil packet on the center of the grill and cover the grill. Cook 15 to 20 minutes or until fish is cooked through. Remove from grill and serve hot with lemon wedges. Enjoy.